What is the armour / structure made of? What material? Is it really strong enough to whack the hammer with only one side connected to the motor? That metal piece with grub screw looks pretty solid. I can understand it being twitchy; in my experience, 2WD with wheels in the middle usually makes for a twitchy machine but still, the method has advantages. The twitchiness is one of the reasons I've gone with 6 and 8 wheel drive for my axe robots but you'll get used to it quickly, I'm sure. Looking forward to seeing it at the next AWS. I have the devo 6e radio. I think.. yeah probably the responsiveness for drive controls can be tinkered with. I'll look into that. To be honest I'm still learning how to use it. Good idea, cheers. @ Mark- The armour is polycarbonate I just spray paint it all black because I prefer the look to transparent. The hammer only getting powered/supported on one side was a worry of mine too. In terms of hitting power it will be okay, George put my mind at ease there and fiddling with the subbed in motor (different ratio) seemed like yeah power should be fine. Physical support and strain on a single motor shaft is still a slight concern but it feels pretty solid when all put together. I think I will at some point before it goes to an event grab a spare motor just in case. The hammer won't be super effective at causing any real damage I suspect. It might get a lucky hit and shake something loose etc but I can't see it doing much against armour. Should be fun making a racket with it through. Have a look in your transmitter menu for the rates. They're naturally set to 100% but you can turn them down for less speed/twitchiness for more control, or even whack them up to 150% for even more uncontrollability! Ha. Tailoring rates to specific ant profiles can give you an extra edge. Though simply practicing is much more fun. That looks great, and we'll done for getting it on weight first time, I wish I could do that. Other than that get lots of driving practice, despite Zero being my worst handling robot I think it's the one I drive the best, simply because its the robot I've used the most. Physical support and strain on a single motor shaft is still a slight concern but it feels pretty solid when all put together. I think I will at some point before it goes to an event grab a spare motor just in case. I've found that with a single motor, the thing which happens is the gearbox on the motor will slowly loosen and then jam and not work at all even though all looks secure but just a touch loose. Just remove the axe shaft after each fight, give the two gearbox screws a tighten up and reinstall the axe shaft. Otherwise you may find nasty surprises such as not being able to self right at a crucial point. The new motor got delivered! I love it. Great stuff. Snazzed him up in team colours. Basically he's done now. I might fiddle around fastening a few bits inside down a bit better but basically he's finished. Obligatory team picture! Ready for June and the AWS! Hmmm. 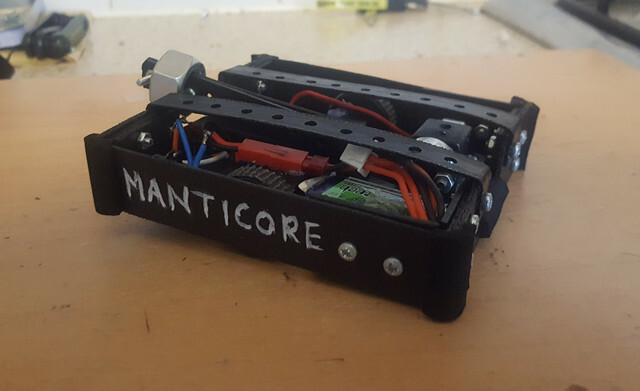 Probably gonna be doing a rebuild on Manticore before he ever gets to an official fight. Spent a while the other day chasing my housemate's kid's RC car and trying to bash it. He thought it was great fun and I got to thoroughly test my bot in a kinda combat situation lol. The hammer works ok, just as Antroboteer said motor on one side means the fittings on the motor loosen a bit and will need a tighten every couple of matches. I can live with that. However. I'm not happy with the 1mm thick chassis.The way it's all bolted together, repeated swinging of the hammer is actually twisting the chassis beheath it and eventually something is gonna split. I am probably gonna build a new body for him from all 1.5mm poly this time. The whole bot can be a bit shorter and I was a couple of grams under anyway so it should be all doable. Out of curiousity, how are brushed N20 motors used for hammers? Are there endpoints somehow set so the motor doesn't burn itself out pushing the hammer arm against the frame? Or do you just use the throttle channel and wing it? Winging it with the rudder channel rather than the throttle is usually the way. It's easy enough to lauch it with a gentle tap left and right, then the spring back on the channel prevents most amounts of over-rotational motor strain. We use the same system in our current heavyweight. Reckoned we'd need some sort of end stop sensor or software but it proved easy enough to control without it as long as the driver is aware of the conditions. Yay, Manticore is finished....errr....again lol. I tested the old one basically to breaking point. The old 1mm thick chassis just wasn't good enough and the weapon was twisting it quite dramatically. And I even managed to ruin another weapon motor, sigh. But so it goes and as a result the new version is loads better! The chassis and armour is all 1.5mm polycarb now except for the two top strips, and as a result it's a lot stronger. 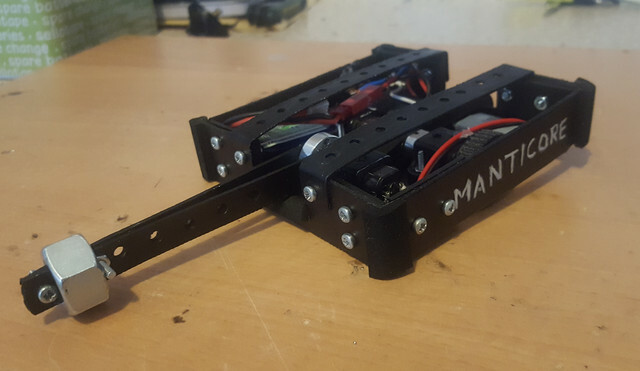 Saved a bunch of weight by making the whole thing about 4mm shorter, managed to get away without needing any weight saving drilling in any of the chassis too. It's much much more rigid now. Next up - well there's still a whole two months until AWS and I need something else to work on. I don't think it's gonna be a whole new bot though. 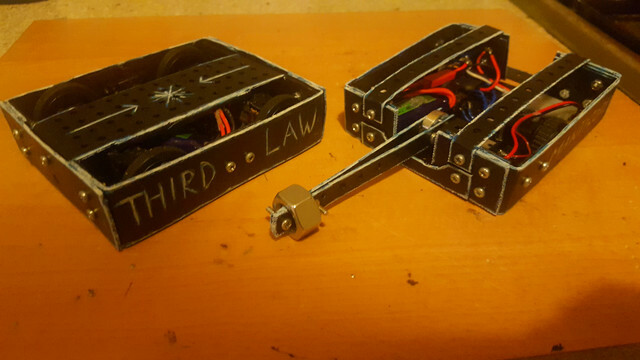 I think now, looking at my first ant Third Law, I could rebuild him taking into account a few things I've learned since and I can definitely make him quite a bit more compact and I think/hope I can save enough weight for a proper wedge/scoop/plough piece for the front. Possibly even in metal for some sparks if it takes a hit on it. I won't be rushing this but I ordered some more polycarb with him in mind. I've been fiddling around with the transmitter and I turned ailerion channel down a bit for easier steering and changed the rudder returning limit to -50 which is enough power to retract the arm and to self right, but means the arm is coming back to rest a lot slower than before. This version also has a strip of 6mm thick rubber under where the hammer rests. Combined with the stronger chassis I'm hoping this all means a lot more reliability for the weapon over time. I must admit that I do like the idea of spray painting the polycarbonate, I might try that myself. What spray paint did you use? Did you have to do anything to the polycarbonate beforehand?